Sha as a child prodigy in China. “The purity and beauty of her sound left the audience speechless.” So wrote China’s foremost composer, Chen Gang, after hearing Sha give the American premier of his “Wang Zhao-Jun” violin concerto. Sha is one of China’s leading violinists on the world stage today. Her singing style and dynamic stage presence has mesmerized audiences from East to West. 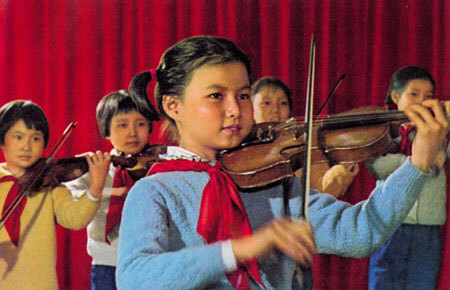 Born in Shanghai, China, Sha started the violin at age six, and as a child prodigy, appeared often on radio and television. Sha’s earliest musical memories were of her father, Cao Peng, one of China’s most famous and respected conductors, leading the Shanghai Symphony Orchestra. They have often shared the international stage. Their memorable father-daughter collaborations include performances with the Orquestra Metropolitana de Lisboa, Russia Philharmonic Orchestra, Shanghai Symphony Orchestra, Shanghai Broadcast Symphony, Shanghai Chamber Orchestra, Taipei National Symphony Orchestra, Kaohsiung Symphony, Hong Kong Chinese Orchestra, and the Singapore Chinese Orchestra. Sha’s Carnegie Hall debut came in 2003, in a sold-out performance with Skitch Henderson and the New York Pops. Her solo appearances have also taken her to Scandinavia, where Swedish newspapers characterized her as, “a formidable interpreter of the music, with wide range, deep feeling and powerful expression.” Lisbon, Portugal praised her for “an enthralling musicality that is almost indescribable”. In 1999, Sha was the featured soloist at the 40th anniversary concert celebrating the “Butterfly Lovers” violin concerto with the Shanghai Symphony Orchestra. A versatile performer, Sha has championed the works of living Chinese composers as well as traditional violin repertoire, performing new music for violin and Chinese traditional orchestra recently in Hong Kong and Singapore. Sha was a special guest soloist on the World Celebrity Series of the 2003 Imperial Garden Concert Series in Beijing. Her American debut was with the Florida Orchestra, winning her audience with “Beautifully rendered lines that come directly from the heart”. Following her performance in Dallas, Texas, Sha was made an “Honorary Citizen” for her contribution to the cultural life. A film version of the “Butterfly Lovers”, starring Sha, was recently broadcast nationally in China and released on DVD. Her performance of this piece has also been released on her debut CD, recorded in Moscow with the Russia Philharmonic Orchestra. Sha’s musical training at the Beijing Central Conservatory began at age 11, where she studied with Ting-Sun Pang and Yao-Ji Lin. She won top honors at the Chinese National Violin competition, and her string quartet won the Chinese National Quartet competition, and the Menuhin Chairman Prize at the International String Quartet Competition of Portsmouth, England. Sha also studied in America with Dr. Eduard Schmieder and the Guarneri String Quartet.